Tom How spent a night over the Bank Holiday weekend at the NFO where he had a good play with the mini-WASP array – I was attempting (half satisfactorily) to polar align the Hyperstar III in the south dome. 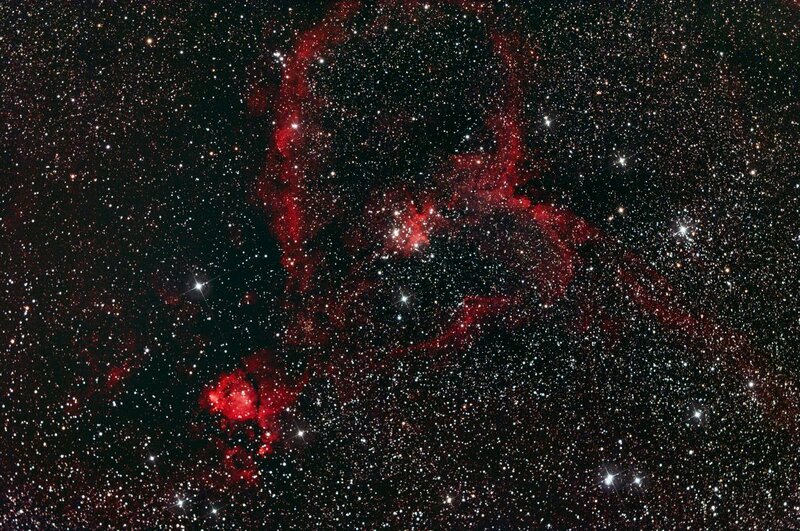 Meanwhile Tom in the North dome was collecting some quite nice Heart nebula data from Camera 1 of the two camera system. This image shows about an hour’s worth of data collected using the Sky 90 with IDAS filter and an SXVF-M26C 10 Megapixel one-shot colour camera. The camera has not yet been collimated which explains the star shape changes across the FOV. However – the camera response is much as I have seen previously with the M25C (bigger pixels) and so it proves as I had anticipated, that I will not see any reduction in sensitivity with the smaller M26C pixels as I am working at a pretty short focal length. So – a step up from 6 Megapixels to 10 Megapixels and then times 2 for two cameras – this mini-WASP array will be producing some amazing data when it is all tuned up. 1) Properly focus train and collimate both cameras. 2) Align cameras for slight overlap so that I can take a 4 x 3.33 degree field of view in one go. 3) Take some new flats with a properly collimated system. 4) Focus train for the H-alpha, H-beta, SII and OIII filters.